What is your favorite Phi Delta tradition? Why? White Cocktail. It marks the beginning of springtime in Chapel Hill and it never failed to surpass people's high expectations. What do you miss most about attending UNC? I miss having all of my closest friends in one town. After graduation you rely on football weekends, weddings and black tie events to see everyone from school. I took for granted things like having dinner with 20 fun guys every night in Johnny J's dining room, or always having pickup basketball games in the parking lot after class. 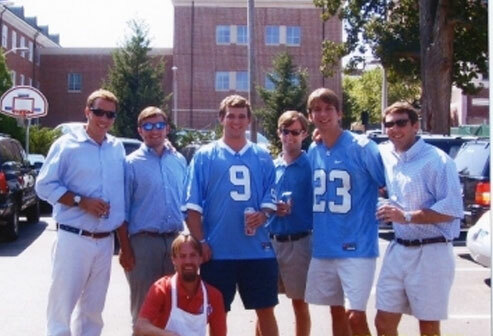 In what ways is the fraternity experience still relevant for today’s student? I believe the experience is based on developing long-lasting friendships and making a positive impact on the school community through service opportunities. I think those fundamental tenants will be attractive to incoming students for a long time. What movie would describe your fraternity experience? I need Charles Hodges to provide a witty answer here. No clue. What’s new in your life today? I am currently living in Charlotte, NC but hope to be back on campus in the fall of 2014 to pursue an MBA degree with a concentration in real estate.